Vijayasena as Mahakshatrapa, AD 240-250. Denomination : Silver Drachm. Date : Year-163 (AD 241). Size : 14.9 x 15.3 mm Weight : 2.24 grams. Grade : VF and better centred than usual. 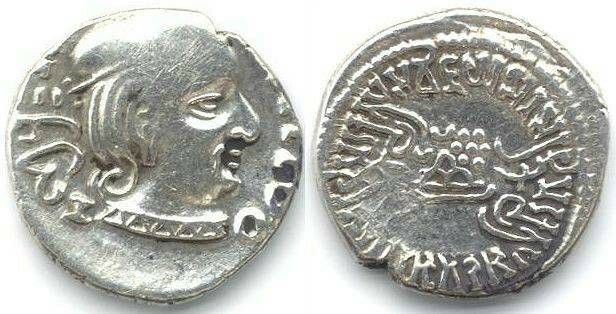 Obverse : Head of Vijayasena right, with an inscription naming him around, including a clear date mark. Reverse : Sacred hill with crescents above, a star burst to the right, and an inscription naming him around. Parts of the inscriptions are off the edge or weak, but examples with full inscriptions are virtually unknown. Examples like this with a readable date mark are scarce.